Rosemary Hildman, age 90 of Shakopee, was surrounded by her family when she entered eternal life on February 2, 2019. A visitation will be Monday, February 11, 2019 from 4-7PM at Ballard-Sunder Funeral Home, 833 S. Marschall Rd, Shakopee. Mass of Christian Burial will be Tuesday, February 12, at 11AM with a visitation one-hour prior at St. Mary of the Purification (The Parish of Saints Joachim and Anne) 15810 Marystown Rd., Shakopee. Rose will be laid to rest at Calvary Cemetery in St. Paul, MN. Her grandchildren will act as urn bearers. Memorials are preferred to the family and will be distributed in Rose’s memory. On the feast day of St. Francis, October 4, 1928, Rosemary Legel was born to parents Clarence and Elizabeth (Bankert) Legel. The middle of three children, Rose adored her mother who taught her the importance of faith. Rose attended St. Agnes and St. Francis Catholic Schools. From a young age, Rose was spirited—she stood up for her siblings and loved them dearly. Rose enjoyed socializing at dances with her friends. Following her graduation in 1946, Rose began working at Northwestern Bell Telephone Company. She eventually served as a training supervisor. When motherhood came along, Rose found herself with an entirely new job—raising her family and keeping them in line! The best chapter of Rose’s life was spent as a loving wife, mother, and grandmother. It all began when she met a young man, Lee Hildman, outside his parent’s grocery store. They dated for several years before marrying in Fort Lewis, WA on August 25, 1954. This union was blessed with the greatest gift from God…their children, Mark, Jeri, Tami, and Lori. The family road tripped across Unites States and Canada in vans, that Rose and Lee converted into campers. Countless hours in tight quarters taught the children the value of family. Without Rose, family trips wouldn’t have been possible. She packed the camper, the kid’s hand sewed duffel bags, and prepared the food, including the traditional peanut butter rice krispies bars and oatmeal raisin cookies. An exceptional cook and baker, Rose had a recipe for every occasion. At Christmas, the family prepared anise cookies, which is still a traditions that stills lives on. For funerals, Rose made her famous Brownie Supreme. After Sunday Mass, Rose prepared a large traditional dinner for the family. She was also a home brewer of rhubarb wine. In her later years, Rose enjoyed going to Culver’s for her favorite treat, a turtle sundae. Rose was a true conversationalist. She not only talked, she listened. Whether with a friend or a police officer who pulled her over for speeding, Rose always said “we had the nicest visit!” She enjoyed weekly chats over coffee with the neighbor gals. If she couldn’t talk to someone, Rose sent a card or letter. She single handedly kept Hallmark and the postal service in business. A talented woman, Rose made her children clothing, crocheted, knitted, and embroidered. During Advent, she crafted each child a manager scene. When they did a good deed, they could place a piece of straw in the manger for the arrival of baby Jesus. It was Rose’s way of encouraging everyday kindness and in hopes of a comfy bed for him. Rose was fearless. Without hesitation she would collect snakes (for the neighbor boy) from her garden and traveled to Europe twice. Rose was the family historian, a difficult task before the internet. She had a great sense of humor and often joked with the staff at All Saints. A woman of boundless faith, Rose dedicated her life to serving the Lord and especially the Blessed Virgin Mary. Through God’s grace, she was an amazing role model for her family. 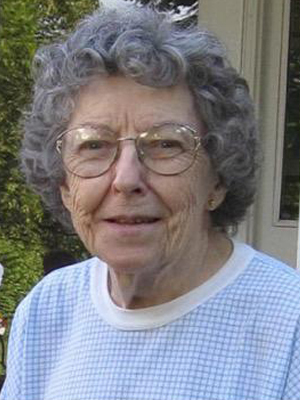 She volunteered with CCD and helped at St. Martin’s in Huron, SD, where she lived for 40 years. Rose was loving, dedicated, and will be missed by her children, Mark Hildman, Jeri Hildman, Tami (Jess) Haeg, Lori Kalahar: grandchildren, Logan Kalahar, Madison Haeg, Nicholas Haeg; brother-in-law, James (Mary Ann) Hildman; sister-in-law, Martha Legel; nieces, nephews and friends. Rosemary rests in eternal peace with her husband, Lee; son-in-law, Tim Kalahar; brother, Clarence “Joe” Legel; sister, Dorothy (Francis) Martin; nephews, Pat Martin and Jim Martin. Arrangements with Ballard-Sunder Funeral & Cremation, Shakopee Chapel. We extend our deepest sympathies to you and your family. May the soul of your mother be at peace with our Heavenly Father.We pray that God will grant you the strength. My most sincere condolences. We will always remember Rose’s smile and warm heart. Sending lots of hugs and prayers to all of you as you celebrate her life. Love you all! Rose was truly an angel. God has a special place for her. Her husband Lee was walking slow for Rose to catch up and walk with him. I will always remember her beautiful smile and always kind words of encouragement. I’m going to miss her “oh golly”! She has always been a favorite in my family. She just always seemed happy and made me feel happy too. Take care Jeri, Mark, Tami and Lori! Dear Friends, what a beautiful obituary, brought tears to my eyes. Rose was such a kind, loving soul, love remembering times spent at your home. She is now at peace & with your Dad, watching over her wonderful family. Thoughts & prayers continue for your family. Hugs to all! So sorry to hear of your mom’s passing. God bless you all during this difficult time. I am very sorry for your loss. Your Mom always had a great smile and the little twinkle in her eyes.